Hands down the Best Air Purifier in the world is manufactured by the top-rated Swiss company IQAIR. This page outlines the specific reasons why IQ Air Purifiers have quickly gained a reputation as the gold standard in the home air purifier and room air cleaner industry. Some characteristics that makes IQAIR the Ferrari of air purifiers is an unheard of HEPA filtration efficiency of 99.5% of all particles down to 0.003 microns and 99% or more for all particles 0.3 microns or larger. This is quite remarkable efficiency compared to most air cleaners - making IQAir about 100 times more efficient than most other room air cleaners on the market today. 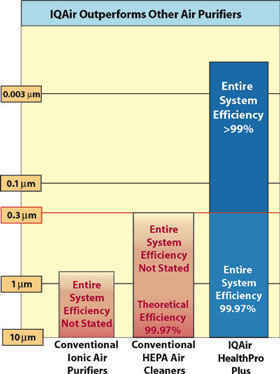 This is not "theoretical efficiency", such as that often deceptively quoted by lower quality brands. IQAir's efficiencies are independently tested and certified to be actual and real, and this multi-phased testing is done so on each and every unit and a certificate of analysis provided. This also is unprecedented! IQAir HealthPro air purifiers also contain the superior "HyperHEPA filtration" technology which is independently certified and again tested in the factory using sensitive particle counters to verify the efficient removal of ultra-tiny indoor air particles down to an unbelievably small 0.003 microns. This is amazing filtration ability given that 0.003 micron particles are ten times smaller than a virus. This makes the HealthPro ideal for medical applications because it can filter out infectious airborne particles one hundred times smaller than what most average room air cleaners can capture. IQAir HealthPro Plus is rated the best air purifier by medical and healthcare professionals and is used in thousands of hospitals worldwide. IQ Air is also rated #1 by top reviewers like Review Board Magazine and Consumer Digest. IQAIR is in an educational partnership with the American Lung Association and an important reason for that is that IQAir air purifiers produce no hazardous Ozone gas, which is a health hazard produced by some popular electrostatic and ionic air purifiers. Each IQAIR purifier also undergoes stringent testing for particle filtration efficiency, filter leakage, and air delivery. And the results of these tests is documented for each and every IQAIR purifier in the form of a 2 page certificate of performance (see images below). IQAIR is also the best air purifier because of their advanced odor, vapor, and particle control capabilities, as well as smart controls, leading clean air delivery rate (CADR), remote operation, mobility, and low cost of ownership with regards to replacement filters and energy efficiency. IQAir purifiers are designed and constructed to avoid common air leaks that reduce efficiency in most other air purifiers. IQAir HealthPro purifiers contain a "Knife-edge seal Patented triple-seal technology" including 3-D Ultrasound sealing manufacturing techniques to assure complete sealing between housing and filter frame so air does not by-pass the filtration systems inside. This is a very sophisticated and rare feature that assures superior filtration efficiencies that far exceed even the theorectical efficiency of other air cleaners. Air sealing is stringently tested to assure each unit is manufactured to the highest standard (no chance leaks). 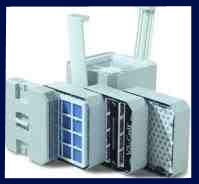 Filter by-pass between the housing and filter frames is prevalent in most common room air cleaners. Regular air cleaners often have published efficiency ratings that are a mirage because they are based only on the air that actually passes through the filter. That is not reality and is deceptive marketing. Filter by-passing greatly diminishes the actual filtration efficiency of the majority of room air purifiers. Yet they don't advertise the realistic efficiency that takes into account any filter by-passing. This is just one example of common room air cleaner manufacturer trickery and is a major reason why most purifiers are not even close to the filtration efficiency of IQAir air purifiers. The IQAir HealthPro is the first home air purifier to pass the world's most stringent HEPA filter test, known as EN 1822. The IQ Air Health Pro is used in thousands of laboratories and hospitals, and IQ Air brings certified performance to the home or office. With IQ Air's EN 1822 certification, the IQ Air HealthPro is proven to filter up to 100 times more allergens and more pollution particles than conventional HEPA air purifiers. The IQAir Health Pro purifier is certified as the world's most efficient HEPA air cleaner in its class. The IQAir HealthPro purifiers Incorporate H12/13 class certified HEPA filters, normally used in multi-million dollar cleanrooms. In fact, while other Hepa air purifiers are rated only for particles down to 0.3 microns, IQAir purifiers have been found to remove particles down to 0.01 microns with close to 99% efficiency. IQAir consistently exceeds expectations and that is why they are the best air purifier on the market today. More information about HEPA filter EN-1822 certification and how it proves which is the best air purifier. IQ Air was selected by the American Lung Association as their exclusive partner for indoor air quality, which provides yet more evidence that IQ Air is respected for being one of the best air purifier manufacturers in the world. This educational partnership is based on the American Lung Association's mission of preventing lung disease and promoting lung health as well as IQAir's mission to provide superior air cleaning solutions and air quality diagnostics that help improve indoor air quality. Every IQ Air Purifier product comes with educational materials to help you improve your indoor air quality. The IQ Air purifier is certified to produce absolutely no Ozone. Ozone is a lung irritant that is emitted from many home air purifiers and ionic air cleaners. Visit our ozone air cleaners page to learn why you should just say no to ozone air cleaners. At the end of that page is a list of ozone air cleaner models to avoid. Even small amounts of ozone can be a major inhalation hazard for allergy and asthma sufferers. IQAir Purifiers were carefully designed to be the best air purifier without the harmful ozone emissions. IQ Air Purifiers are top rated as the best air purifier used by hospitals worldwide. Very few commercial air purifier models can meet the extremely stringent medical-grade standards for ultra-efficient filtration required for hospital applications. IQ Air was recently selected by the Hong Kong Hospital Authority as the only room air cleaner powerful enough to be used in the fight against SARS. Now you can have the same medical grade air purifier for your home! IQAir HealthPro air purifiers contained Hyper-HEPA filters which can remove even ultra small bacteria and viruses (such as the tiny SARS virus) from indoor air. In spite of the array of advanced features, the cost of IQAir systems is only a fraction of that of centralised air cleaning systems. As a result, IQAir systems enable health-care facilities to add to, or extend airborne hygiene measures to areas and patients which so far were not within the scope of an advanced airborne infection control strategy. IQ Air purifiers are the best air purifiers for healthcare facilities on a cost to performance basis. Biological pollutants and other airborne pathogens and bioaerosols in health-care environments pose a particular risk to immunocompromised patients who may inhale fungal spores, bacteria and viruses. Airborne microorganisms can not only complicate recovery from surgery, but can also lead to life-threatening infections,costing health-care services hundreds of millions every year. Hospital-acquired aspergillosis for example has been recognised increasingly as a cause of severe illness and high mortality in immunocompromised individuals, e.g. patients undergoing chemotherapy and/or organ or bone marrow transplants. In the light of the marked increase in nosocomial infections over recent years, many of which are caused by drug-resistant pathogens, the importance of using high-efficiency air filtration systems beyond the confines of so-called “critical areas” (such as operation theatres) has once again been emphasised. Both the World Health Organisation (WHO) and the Centers for Disease Control and Prevention (CDC), advise that, wherever possible, preventive infection control measures should be implemented to reduce the risk of nosocomial infections. IQ Air's proven filtration efficiency makes it a standout in the air purifier industry and sets it apart as a provider of the best air purifier for such infection control. IQAir Portable HEPA-Systems can Effectively Reduce Infection Risk. One such preventive control measure is the filtration of the air within a susceptible patient´s room. Such devices have shown to effectively reduce the concentration of aspergillus spores (which range in size from 1.5 µm to 6 µm) to below measurable levels. Even tiny airborne particles such as viruses and bacteria can be removed from the air with over 99% efficiency by advanced HEPA air cleaning systems. IQ Air purifiers are proven to be the best air purifier for such filtration. The CDC recommends that only HEPA-filters that have “a demonstrated and documented minimum removal efficiency of 99.97% of particles ≥ 0.3 µm in diameter should be used for infection control purposes. Very few HEPA-systems provide this efficiency guarantee. IQAir is one of the very few. The IQAir Series consists of several modular filter systems, each optimised to deal with a different range of airborne contaminants or aiming to fulfil a specific air hygiene requirement.The IQAir Chemisorber for instance has the primary function to filter aldehydes, while the IQAir Cleanroom H13 is dedicated to the removal of airborne microoganisms (e.g. bacteria, viruses & spores). The IQAir purifier is the only room air cleaner clinically proven to be the most effective allergy relief air purifier and is the best air purifier amoung all home air purifiers reviewed for sufferers of allergic asthma. IQ Air passed the most comprehensive double-blind, placebo controlled clinical trial. The IQAir HealthPro Plus is also rated the best air purifier by medical and healthcare professionals. Like the air purifiers supplied to hospitals, all IQ Air HealthPro purifiers are individually tested and certified before they leave the Swiss production facility. Each IQAir HealthPro purifier is tested for particle filtration efficiency, filter leakage and air delivery. 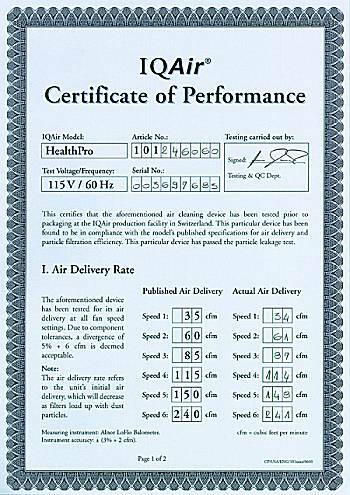 Each IQ Air HealthPro purifier comes with its very own two-page Certificate of Performance, detailing the test results for that very machine. Unlike most home air purifier manufacturers IQ Air is very serious about proving that each of their IQAir purifiers is the best air purifier you will ever find. To guarantee filtration efficiency and air delivery, the Swiss manufacturers have taken an uncompromising approach: Each IQAir device is individually tested and certified. For the IQAir Cleanroom H13, for example, that means a guaranteed filtration efficiency of 99.97% for particles of ≥0.3 µm and a certified maximum air delivery of at least 400 m3 per hour at maximum fan speed. 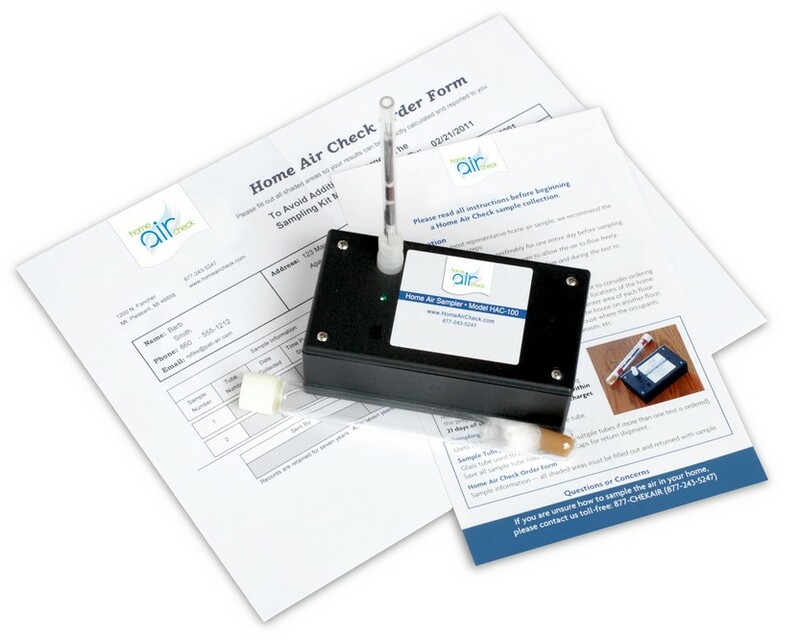 IQAir Quality Control:The actual efficiency test results are documented on the numbered test certificate supplied with each IQAir system. The IQAir HealthPro purifiers use the highest quality German engineered, high performance fan available. The IQ Air Health Pro purifier has a centrifugal, backward curved fan with an astonishing 700 cfm (cubic feet per minute) rating. Its 2950 rpm (revolutions per minute) make it the most powerful fan in its class. Because each IQ Air purifier fan is individually balanced and uses steel ball bearings, reliable quality and performance for many years to come is common for IQAir purifiers and yet another reason why the IQAir HealthPro purifier is the best air purifier. The HealthPro Plus IQ Air purifier model features the V5-Cell - which is the most advanced gas and odor filter available in a residential room air purifier. It contains a unique blend of granular activated carbon and impregnated alumina. The IQAir HealthPro Plus is the best air purifier for removal of a wide range of unwanted household odors and VOC (volatile organic chemicals) and other gaseous household air pollutants. The GC series of IQAir purifiers are designed for specific control of gaseous compounds. • Six Speed Settings - Most home air purifiers provide only two or three fan speed settings. This often leaves you with the choice to either run the unit at a quiet, but ineffective fan speed, or to run it at a more powerful, but noisy speed. The IQ Air HealthPro purifiers give you the choice of six fan speeds, allowing you to select the ideal performance-to-sound ratio. • Integrated Timer - Program the IQAir HealthPro to turn itself on and off based on your lifestyle. Set the unit to run during office hours or program it in your bedroom to go on after you have reached deep slumber. Flexible Point-of-Use Application As IQAir systems work independently and decentralised, each unit´s air delivery and timer programme can be adjusted to suit the requirements of the room where it is located. The portable nature of the device also permits quick relocation or supplementary filtration, if needed. The variety of IQAir models available,allows matching the most suitable filtration technology to the specific indoor air quality problem at hand. 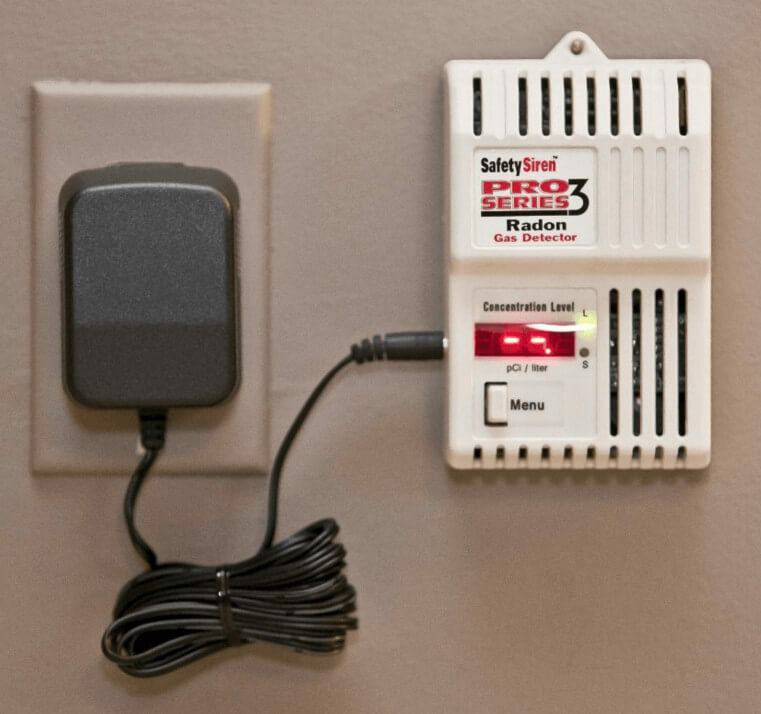 • Remote Control - Operate your air cleaner from as far as 30 feet away. With its large fan motor, the IQ Air HealthPro purifier produces more clean air with less noise. Unlike most air cleaners, which have the fan motor located after all filter stages, the IQAir HealthPro has the fan in the center, in-between its noise absorbing filters. A unique double-walled housing design and 8 vibration-absorbing rubber pads make the IQ Air HealthPro the best air purifier for quiet operation. The IQ Air Health Pro is suitable for even the most noise sensitive environments and is virtually inaudible on the low fan speed settings. • Independent Filter Stages - Conventional home air purifiers often combine several home air purifier filter types into one filter cartridge. As a result, the whole filter cartridge has to be replaced even if only one filter type is used up. This is another one of those many tricks of the trade to get you to spend more money on home air purifier filters. The IQ Air HealthPro purifier has a modular design, which allows each filter type to be replaced individually, saving you money on home air purifier filters in the process. One of the most attractive features of IQAir systems is the ease with which filters can be replaced. Whether the system is wall-mounted or floor-based, a patented system allows quick and safe access to all filter elements without the need for tools. In practice this means that the “down-time” of the filtration system, and consequently the build-up of pathogens in the room, are kept to an absolute minimum. • Intelligent Filter Life Monitor - With ordinary air cleaners you have to either guess when to replace the purifier filters or follow a rigid replacement schedule, such as "replace home air purifier filters every 6 months ". IQ Air's intelligent filter life monitor on the other hand calculates the life of each purifier filter based on actual usage. Integrated Microchip Calculates When it´s time to Change Filters. With regard to maintenance and filter change, the IQAir Series offers several advanced features. Every model is equipped with its very own microchip-controlled filter life monitor, taking air pollution load, actual usage and fan speed into account. When a filter element reaches the end of its useful life, an LED indicator will light up on the IQAir´s control panel, informing staff that it is time to change filters. • Super Efficient Pre-Filter - The IQAir HealthPro purifier features the best air purifier pre-filter of any home air purifier - the IQ Air PreMax. The PreMax pre-filter already removes over 90% of the particle weight from the air going through the IQAir air purifier. allowing the IQ Air HyperHEPA filter to last up to 5 times longer than similar filters in ordinary room air purifiers. Even though it's extremely powerful, the IQ Air Health Pro purifier is also very energy-efficient. This is achieved with an energy-efficient fan and electrical control system. Even when used 24 hours a day, the IQAir Health Pro purifiers typically use less than 30 cents worth of energy per day, making it the best air purifier for energy efficiency. Most home air purifiers return air to a room through a small outlet, which creates annoying air drafts and noise. The IQAir HealthPro purifier is designed to avoid air drafts. The IQ Air Health Pro purifier evenly disperses the clean air through a large 3200 vented diffuser, so you will always feel comfortable. With its sculptured design, the IQAir purifier enhances the decor of any home or office. Unlike low grade plastics used in some room air purifiers, IQ Air's housing materials are impact resistant, contain no heavy metals and do not omit gas, an important detail for sufferers of Multiple Chemical Sensitivity or MCS. Engineered and manufactured in Switzerland, the IQ Air HealthPro is the best air purifier for durability as well as performance. Since the IQAir Health Pro Plus was launched, it has received more #1 product reviews than any other home air purifier on the market. IQAir purifiers are recognized around the world as the most advanced room air purifiers ever designed. Whether used in homes for allergen control, or in hospitals for infection control, IQAir has just the right home air purifier to provide the best possible air quality. Need more proof the IQ Air Purifier is the best of the best air purifier on the market today? Air quality experts are some of the staunchest endorsers of IQAir purifiers because they deal with indoor air contaminants every day and know how few and far between effective indoor air purifiers are. They also care about the air people breathe and they know many home air purifiers aren't effective at all when it comes to particles and gases cause by many of the following household chemicals and products in the chart below. I know of many experienced Commercial and Residential Environmental Assessors, indoor air quality experts, and healthy home consultants who also rave about IQAir purifiers. These expert assessors specialize in indoor air quality testing in homes and businesses to see what contaminants could be making occupants sick. They also know what technologies actually work to help fix the problems they detect and observe. Many of them personally own and highly recommend IQAir HealthPro purifiers because they are PROVEN to be the best of the best air purifier models to clean indoor air of the toxic particles and gases produced by biological contaminants, as well as common indoor air contaminants often resulting from use of many of the above household products and chemicals indoors. In industry circles it's widely known amoung the experts that an air purifier comparison always results in the IQAir HealthPro Plus purifier vastly out ranking any filterless air purifier or ionic air cleaner or Hepa air purifier. "It's clearly the Farrari of the room air purifier industry", said one expert we talked to. Another Environmental Assessor we know has been in the business for twelve years now and is also a member of the Environmental Health Association, Lung Association, and the Allergy and Asthma Association. He also highly recommends (above all others) the IQAir HealthPro Plus purifiers to his clients. In his twelve years of experience with home and commercial building indoor air quality testing, he usually ends up recommending the IQAir HealthPro Plus purifier to his clients because "it’s the best air purifier for efficient removal of even the tiniest most damaging particles and gas molecules." "Simply put, it works and works very well, on a level far and above most others." I'm sure most indoor air quality experts will also agree that the majority of air cleaners sold online and in retail stores are junk for multiple reasons - such as poor filter quality / horrible filter efficiency / substandard filter media / poor housing/fan design and insufficient clean air delivery and air changes per hour. "Many of the cheapos even do more harm than good because they give off toxic Ozone gas as a dangerous by-product of their operation." And some fly by night manufacturers even market their Ozone emitting air purifiers as if the toxic gas were beneficial to health and air purification. These dangerous devices are often marketed using various buzz words like: "ionic air purifier", "electrostatic air cleaners", "ozonators", "ozonolysis", "activated oxygen", "super oxygen", and "electronic air purifier". For the experts, IQ Air is in a category all its own because it has none of the all-too-common problems like Ozone emissions. It's like the metaphorical Apple I-pad of purifiers. It's the closest thing to a perfect air purifier anyone will find, and the cost is lower when energy efficiency, filter life, overall performance, quality of parts, rare 5-year warranty, certified results, and advanced durability/design is factored in. "Don't Be Penny Wise and Pound Foolish By Buying Deceptively Cheap Home Air Purifiers"
The above average price of IQAir reflects all the above positive factors. Such superior technology could not be sold for less. IQAir actually offers a tremendous value when all factors are taken into consideration. In the long run, given all the above listed attributes, the cost to benefits of an IQ Air purifier makes it a wise and cost-effective investment in your family's health and breathing comfort. The experts all know IQAir is THE wisest air purification investment a homeowner can make. That's why it is recommended to homeowners more than any other purifier. As the song goes, it's "simply the best...better than all the rest". But many consumers make the mistake of focusing only on the higher price point of IQAir, relative to other units - assuming they can effectively fix indoor air quality issues by buying multiple cheaper units instead. Cheaper is often really more expensive in many ways not immediately obvious to consumers. And you just can't remove the most damaging particles to any meaningful degree with a $200 flimsy model made in China. 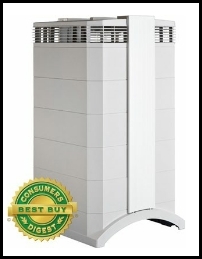 If there is one product you should definitely never skimp on quality, it is an air purifier. The cheap price logic is flawed, particularly in this industry, since it results in a waste of money for the units themselves, plus future expenditure for the replacement purifier filters that are often sub-par to begin with, and deceptively expensive too. "Beware the Dirty Trick of Cheap Air Purifiers Lacking Any Form of Pre-filtration!" Lack of a high quality pre-filter means that course particles (that a pre-filter would normally remove from air first) will more quickly clog the fine pores in the more expensive particle or gas filter media. In other words, good pre-filters are essential for extending the life of internal HEPA and Chemical filters which usually cost more to replace. If larger particles of lint, dust, hair, pet dander, and fibers is not preliminarily filtered out of air entering a purifier, the effective life-span of the more expensive inner filters that filter finer pollutants will be greatly shortened. High surface area pores are an essential factor for fine gas/odor/particle capture. When the pores become heavily clogged, the filters must then be replaced in order for filtration efficiency to remain high. This is another under-handed trick of the trade to get you to buy more of their expensive "consumables" (the high-end replacement filters) sooner. It's similar to the Gillete razor and razor blade model. They make more off the replacement consumables (blade heads) in the long run. So they are happy to sell the "razor" cheap on the front end. This is also a very common strategy in the air purifier industry, but definitely NOT with IQAir's market leading products which are top of the line in all regards. IQAir's prefilters alone are so good they remove both course and fine particles better than even the HEPA filters inside most other home air cleaners on the market today! So yes, the experts know that quality trumps quantity every time when it comes to a good home air purifier. And besides the pre-filters, you also need true HEPA and chemical gas filtration which is independently certified to remove the finest particles responsible for most health damage associated with indoor air pollution. These prerequisites rule out about 90% of all room air cleaners on the market today, and no one can match the high standard set by Swiss-made IQAir. No matter how many bargain air cleaners you place throughout your home, if a cheapo can't capture any volatile organic chemical gases or remove the tiniest particles that travel deeply into lungs (and thus do the most damage)...then they are all worthless. 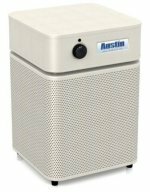 You have to pay more for purifiers that TRULY and efficiently purify the air of ultra small gas molecules and sub-micron sized solids. "Always Look for Effective High Capacity Chemical Gas Filtration Ability"
Price aside, if an air cleaner model lacks any filters or option to capture chemical gases, it immediately gets demoted in my book. 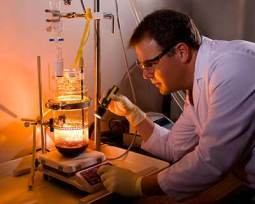 Toxic chemical gas removal is usually a key part of fixing bad indoor air. Always consider if a model includes significant ability for chemical filtration and whether the manufacturer proves the model can efficiently control a wide variety of chemical gases inside your home. "And Then There's the HEPA Filter...(or Lack Thereof)...and How Effective it is at Capturing Ultra Fine Particles"
Most vendors make fancy claims about ability to capture most particles, but they hardly ever back their trumped up claims with un-biased test data and a certificate of performance, as IQAir always does. You often get what you pay for when you opt to buy one of the ultra cheap made in China air cleaners. Experts will often confirm that most of the sub $300 units, and even many above that price, are an utter waste of money...not very effective, not even as crude dust collectors. HEPA (or "high efficiency particle arresting") filters is another major area where manufacturers skimp on the quality of the media and the all-important filter housing/air tight seal. Dirty air by-passing around the filters, plus psuedo-HEPA trickery is very common in cheaper units. Again, with HEPA filters, you get what you pay for. 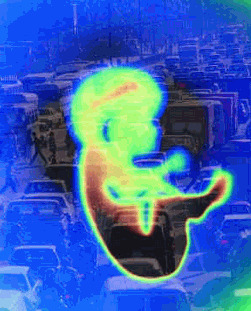 Cheap often correlates to inability to filter out 90% of the smallest and most health damaging particles. And if a model does work even half as well as an IQAir, the capacity for that performance is often very limited, meaning expensive filter replacements will be needed often to sustain even mediocre levels of air purification. IQ Air's HealthPro Plus has the multiple pounds of advanced filter media (for chemical gas removal) plus highly advanced parts and carefully engineered woven materials to do the job well above even the most stringent industry standards. The fact that it is proven to efficiently clean air of even ultra tiny viruses, such as SARS/Bird Flu, verifies to me that it has way better than standard HEPA filtration. IQ Air calles it "HyperHEPA filtration". It's unmatched here too. IQAir is like a heavy duty industrial clean-room quality purifier, but for use in your home, as well as industrial and healthcare settings. It's powerful, ultra efficient, very well made, and super effective for very long periods of time before filters typically have to be replaced. Experts know the Filtration capacity and scope of pollutants captured are unmatched in the HealthPro Plus. Every energy efficient, air-tight home should have one to compensate for our "better lives through modern chemistry". Health Pro Plus has also gained notoriety as being like a god-send for anyone suffering from any form of respiratory disease or condition. It has also become the preferred home air purifier for sufferers of Multiple Chemical Sensitivities (those with MCS are like the human canaries in the coal mine for immune response to even trace chemical air contaminants). "The IQAir HealthPro Plus is simply the best air purifier. It puts out the purest air." one colleague stated. 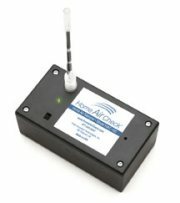 Being an experienced Environment Assessor, he deals with asthma and allergy sufferers every day and knows that most of the time the problem can be significantly helped with an effective home air purifier which filters out the smallest of gas molecules and sub 0.3 micron particles with near 100% efficiency. Experts know that if a home air purifier isn't able to do this, it's not going to filter out 90% of the most damaging indoor air pollutants. IQAir HealthPro is one of the few actually PROVEN to be the best air purifier available for this difficult to achieve level of filtration. Health Pro Plus is the best air purifier in the world for anyone really serious about gaining the health benefits of breathing TRULY pure indoor air.